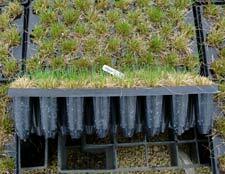 Prairie Plugs™ have a 2 ¼ inch top diameter and measure approximately 5 inches deep. Our 5 inch deep container has grooves running vertically which channel the roots down to the bottom of the pot where they are air pruned. 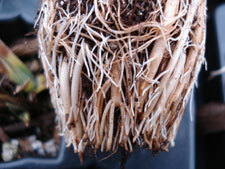 This eliminates root circling and stimulates lateral branching and the development of more root tips. The benefit to you is that Prairie Plugs™ are healthier native plants providing faster establishment when planted out or shifted to larger containers. Our redesigned tray is now molded of a higher density plastic with thicker walls allowing easier plant extraction at the planting site. Customers tell us that the one piece tray with 38 plants per tray is more convenient to handle than individual small pots making their planting job easier and faster.